One year ago, Craig Alexander broke a 15-year course record to win his third Ironman® World Championship. His new book As the Crow Flies, just released in time for the 2012 Ironman World Championship, tells the complete story of his history-making season. As the Crow Flies: My Journey to Ironman World Champion reveals Crowie's approach, his training, and the relationships that delivered the race performance he says was a decade in the making. As the Crow Flies is now available in bookstores, bike and tri shops, and online. For more information, please visit www.velopress.com/crowie. With his 2011 win, five-time triathlon world champion Craig Alexander joined the sport's most exclusive inner circle of all-time victors. With Dave Scott, Mark Allen, and Peter Reid, Craig Alexander is one of triathlon's greatest champions. In his own words and through striking photographs from acclaimed sports photographer Paul K. Robbins, Crowie shows what it takes to race at the elite level-and how he balances the work of triathlon with his first priority, his wife Neri and their young kids Lucy and Austin. Epic workouts, grueling travel, record-setting race performance, giving back to sponsors and the sport-these are the tools of Crowie's trade, not to mention sleek wetsuits, cutting-edge time trial bikes, and technical footwear. And while those who know the sport of triathlon intimately will say that performance is determined by how triathletes put the three disciplines together, As the Crow Flies shows that winning major races comes from working toward excellence in every aspect of the triathlon way of life. In As the Crow Flies, Alexander reflects on his entire 2011 and early 2012 season, bringing triathletes inside his head during key workouts, training blocks, and pivotal moments in big races. Crowie struggles through injury, illness, and changing sponsorships, revealing the delicate balance between elite performance and disaster. On the road to Kona, Alexander won the Ironman 70.3® World Championship, making him the first person to "do the double"; win both world championships in the same year. To Crowie, the hallmark of a great career is the ability to perform consistently and to be versatile as an athlete. At age 39 and coming off his first-ever sub-8 hour win at Ironman Melbourne, Craig Alexander shows in As the Crow Flies how he has prepared to win again this October at Ironman Kona. 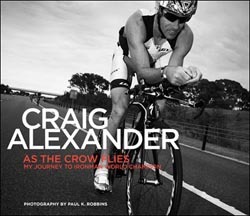 As the Crow Flies offers triathletes and sports enthusiasts a beautiful, intimate, and honest portrait of the life and work of professional triathlete Craig "Crowie" Alexander, five-time triathlon world champion and one of the sport's most successful athletes. VeloPress publishes books for cyclists, triathletes, and runners that help beginners and committed athletes build fitness and achieve their goals. VeloPress celebrates the icons of endurance sports through history books, biographies, memoirs, and photography books. VeloPress is a division of Competitor Group, which publishes Velo, Triathlete, Inside Triathlon, and Competitor magazines and produces the Rock 'n' Roll Marathon series, TriRock triathlon series, and the Muddy Buddy adventure race series. For more information, please visit www.velopress.com.